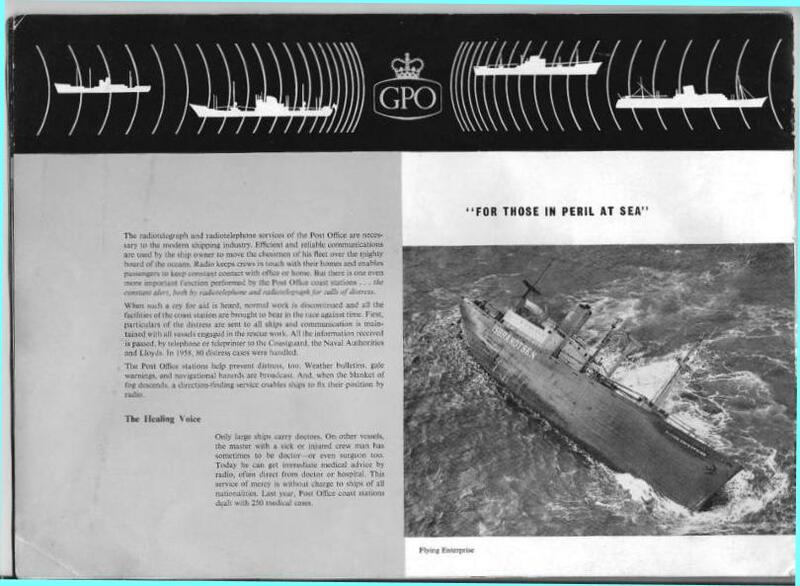 Landsend radio, callsign GLD was the maritime medium frequency coastal station that controlled the South West approaches to the English channel and the UK---also covered the Bay of Biscay area and down the Portuguese coast and Southern Spain. The latter two mainly at night time. I have personally heard GLD down the coast of Morocco on some evenings. Landsend radio station GLD has been watching over shipping travelling to and from the UK since around 1913 from the station at St.Just, Cornwall. They had a daytime range of around 300 miles on MF W/T (wireless telegraphy) and about 200 miles on MF R/T (radio telephony) and considerably longer distances at night time given suitable ionospheric conditions. They kept a 24 hour, seven days a week, 52 weeks a year listening watches on the international distress frequencies of 500 khz for radiotelegraphy, 2182 khz for radiotelephony and channel 16 VHF. They controlled many distress communications over the years including some quite famous ones such as the Torrey Canyon disaster, the Amoco-Cadiz and Flying Enterprise distresses plus many many more. 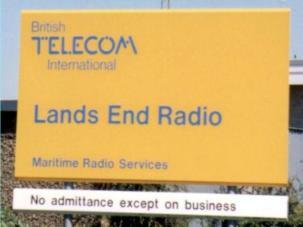 In fact Landsendradio GLD was the coastal station that received the very last distress signal sent on 500 khz wireless telegraphy on the very last day before the closedown of the 500 KHZ distress frequency listening watches, even though it was in the Landsend radio GLD area (but actually picked up by Stonehaven radio GND on a remotely controlled Landsend receiver). The vessel in distress on that day was the M/V OAK. 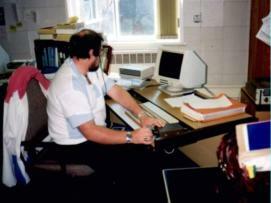 In 1979, after a move to a new radio site at Skewjack, Cornwall, due to mutual transmitter to receiver interference problems, so now with some distance between the transmitters at St. Just (now being remotely controlled from the Skewjack site that also housed the GLD receivers) and the rest of the GLD station. GLD was a very busy station and quite famous worldwide, a lot of ships bound for the UK and Northern European port areas would be told to “proceed to Landsend for orders” LEFO for short. Another reason for the fame of Landsendradio was the fact that POLDHU, in Cornwall, was the site where Guglielmo Marconi first sent his message across the Atlantic ocean to “Signal hill” in St. John’s Newfoundland on 12th december 1901. 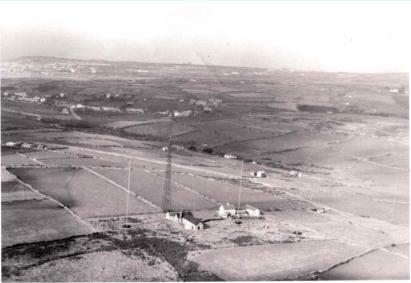 The Poldhu site was very close to where Landsend radio GLD was situated. 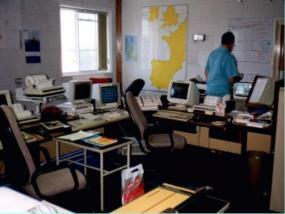 Unfortunately, the coastal radio station at Landsend was completely closed down on 30th June 2000 together with many of the other UK and European coast stations who also had to close their doors due to the coming into force of the new communications system of GMDSS. (Global Maritime Distress and Safety Systems). 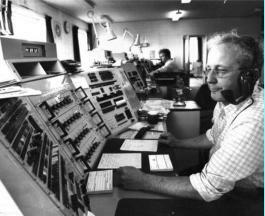 A very sad day for all Radio officers and the end of an ERA in maritime radio communications. Landsend for orders (LEFO) Hooray! we are going home on leave---back to the UK---we hope! 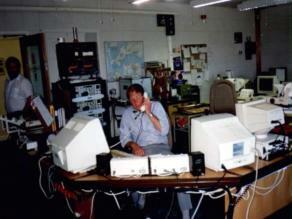 These are the only UK coastal radio stations pictures and information we have at present, GKA, GLD and GKZ. We certainly have not forgotten about the other UK coastal stations, but we do not have any pictures/stories/descriptions etc as many seem to be copyrighted or personal. Above photo kindly supplied by Ex GLD R/O Tom Eaves, picture taken while flying his plane a MILES MESSENGER M38 callsign GAJKK over the Landsend peninsular. The view is to the NORTHEAST. 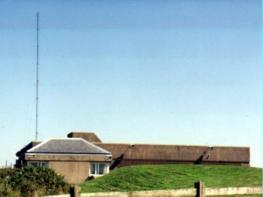 The small white building next to the big aerial tower was the VHF radio transmitter room. The building next to it with the chimney was the boiler room and the station restroom/kitchen. The long white building with the large door at the end was the station operating room, with the transmitters in a seperate just inside the large black door. 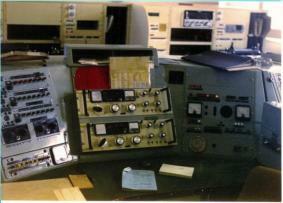 The picture was taken before the Decca Company installed a Decca transmitter in a portakabin just to the right of the right hand white building, which was the emergency generator room. The buildings are still there, but their present function is unknown. The station stood some 400 feet above sea level.